“With her third novel, Jacob’s Room, Virginia Woolf’s style became indisputably modern. Throwing off novelistic conventions, she devised a radical new book shaped by the memories of a lost brother, a clear-eyed feminist sensibility, and a fierce pacifism. 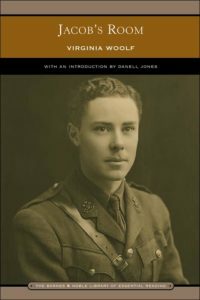 Using a condense, imagistic method, Woolf tells the story of Jacob Flanders, a young man destined for the trenches of World War One. Published during a year of daring literary experiment such as T.S. Eliot’s The Waste Land and James Joyce’s Ulysses, Jacob’s Room forged a fresh direction for the course of the novel. The privileged, bookish world of Jacob’s Room shares much in common with Woolf’s own. Born Adeline Virginia Stephen in 1882 to the editor and scholar Leslie Stephen and his second wife, the tragically beautiful and austere Julia Prinsep Stephen, Woolf showed a passion for words at a young age. Given free run of her father’s excellent library, she gulped down classics: Coleridge, Lamb, the Brontës, Spenser, Browning, Austen, Homer, and, of course, ever more Shakespeare. But along with this feast of words, she became acquainted too young with grief. Her mother died suddenly in 1895 when Woolf was thirteen, an event that triggered her first mental breakdown. Throughout her twenties and early thirties, Woolf suffered several more serious attacks of mental illness. Close on the heels of her mother’s death came the loss of her half-sister, and a few years later her elderly and grief-stricken father. But it was the death of her beloved older brother Thoby in 1906 that shaped the story of Jacob’s Room. His death from typhoid at the age of 26 was yet another sudden, tragic blow. He had been, for Woolf, a gateway out of the family home and into the world, first as a literary sparring partner, and later as her entrée into the circle of artists and intellectuals who would become known as the Bloomsbury Group. Filled with uninhibited conversation, the Thursday evening soirees with Thoby’s Cambridge friends offered a refreshing contrast to the society parties her half-brother George Duckworth forced her to attend. Among those she met was Leonard Woolf, a young civil servant who became her husband in 1912. Together they dedicated their lives to writing, to publishing innovative books through their avant-garde publishing house, the Hogarth Press, and to their wide social circle. After a devastating period of mental illness between 1913 and 1915, Woolf lived another twenty-six years, until the last weeks of her life, without another complete breakdown. Unquenchably social, yet always living in the shadow of another attack, she had to balance her love of people and work with her need for rest and quiet. Buy the book: Jacob’s Room.